all designed and executed by Beata Wielopolska and Bożena Motylewska-Wielopolska. Its origin goes back to our first visit to the Venetian Carnival in 1996, although as a consistent project the collection has been developed since 2006. 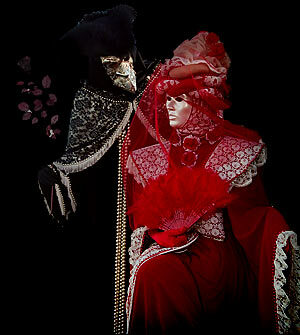 All costumes are independent artistic creations inspired by the contemporary Carnival of Venice. Only rarely do they refer to their historic prototypes, such as the figure of the Harlequin (ours, however, has hardly anything in common with the "commedia dell’arte" character of the 16th century) or to the in the 18th century immensely popular "bauta". For the purpose of stage and performance, our "bauta" had been raised to the rank of the Doge. Apart from the Harlequins, the collection is dominated by both the figures of ladies and the groups of figures evolving around a particular subject matter: Arriving from Space, Requiem, Widows, Gnomes, Water, Medusas, Snowflakes, The Four Seasons. Their names suggest an ongoing search for meaning and a desire to expand beyond the ordinary. New pieces are continuously being added to the existing collection.